The cutting of the first sod on the peaceful landscape at Ardnacrusha for the purpose of harnessing the Shannon, heralding Ireland's industrial revolution sounded the death knell of the snap net fishing on the Shannon. 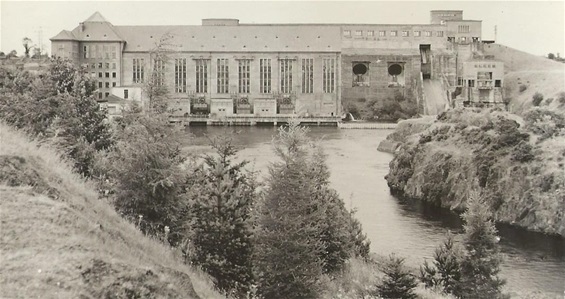 The Shannon Electric Power Scheme which began to generate current for the 26 counties on October 24th 1929, had far reaching repercussions on the Shannon fisheries and in particular on the Abbeymen. In the Winter of 1929 and the Spring of 1930, salmon on their journey upstream to the spawning beds were confronted with a new river, the Mill Race. 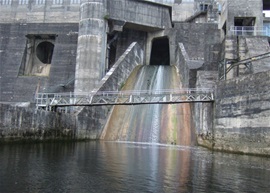 The Shannon water is diverted into the Head Race at O'Briens Bridge and thence through the Power House into the Tail Race which rejoins the Shanon just below the old Lax Weir. The Tail Race having a current much stronger than the main river from which it had borrowed water, appealed to the instinct of the salmon. The fish followed its one and a half mile course only to find the Power House blocking their path. 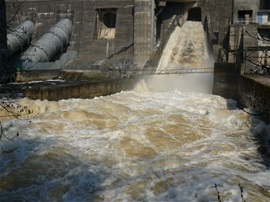 The trapped fish died in thousands, while fish which had by-passed the Tail Race and found their way up the main Shannon were trapped above the Power House when they attempted to return via the Head Race. Salmon fry trying to make their way to the sea also found themselves landlocked. They could be seen in shoals above the Power House. If it were possible to count the spawn lost, adult fish which died in the Tail Race, fry trapped above the Power House, salmon converted to fish meal by the turbines and electrified by the chains at the entrance to the Tail Race, the total would surely run into millions. The combined depredation of every poacher since Thady Quill could not match the damage done by the E.S.B. in one year. The Limerick Fishery Board of Conservators discussed the matter at Government level, and as a result had a barrier of electrified chains erected at the mouth of the Tail Race at a cost of £1,500.The purpose of this barrier was to prevent fish from entering the Tail Race, it stopped them alright, dead in their tracks. After some hundreds of fish had been killed in one day, the use of the chains was discontinued. The Abbey fishermen were greatly perturbed by all this wanton slaughter of salmon and they were determined that it must stop. One must remember that in the years 1929, 1930 and 1931 their very livelihood was being undermined, their families on the point of starvation. They had made a proposal that a grid be arrected at the mouth if the Tail Race or alternatively that a fish pass be erected at the Power House. Both of these proposals were ingored by the Government. It is interesting to note that a fish pass which I am informed is working successfully, was completed in 1960 (30 years later). The majority of the fishermen had Republican leanings and when Fianna Fail gained power in 1932, they hoped for better treatment. Fishing in the Tail Race with rod or net was prohibited at this time. 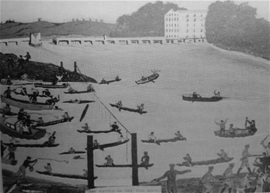 The Abbeymen sought permission to fish the Tail Race, pointing out the plight of their families and the numbers of fish which were being needlessly destroyed. They had the backing of a number of public representatives and prominent citizens in this request. Permission to fish was refused by the Department of Industry and Commerce. On Monday, 11th July 1932, the fishermen sent a deputation to Mr. Bindan Alton, Secretary of the Board of Conservators, to inform him that it was their intention to fish in the Tail Race that night and the following nights as a protest against the non implementation of their suggestion. A notice to this affect was also published in the Press. The late Ald. D. Bourke, T.D., called on the Superintendent of the Garda Siochana requesting him not to impede the fishermen. The Superintendent signified his intention to enforce the law, stating that anyone who entered the Tail Race for the purpose of fishing would be prosecuted. At 11 p.m. that night there was a full muster of fishermen at their moorings in the Grand Canal. Mr. Denis Hayes, their champion, impressed upon them that under no circumstances was violence to be used. They proceeded to Corbally and re-grouped at St. Thomas's Island. The nets were prepared for fishing and on the stroke of midnight they moved off towards the Tail Race. Signs of great activity were apparent at the demarcation line between the Shannon proper and the disputed waterway. Bailiff's and Gardai had three launches with search lights at their disposal. Two of these launches were moored, one at each side of the navigation gap in the chain barrier. The remaining boat had a roving commission. Rumour had it that the electricity would be turned into the chains, but this did not deter the fishermen. The turbines at the Power House were turned on full power to create a strong current, presumably to make the handling of the boats more difficult. Inspector Lane shouted a warning that the Tail Race was out of bounds, there was a moment of hesitation, but with the cry of ''UP GARRYOWEN'' and a few deft strokes of their paddles, Randy and Lully Hayes sent their boat surging in between the chains, behind one of the launches. This was the signal for concerted action. In a matter of minutes all the boats were inside, the battle was on. There was considerable confusion as the Gardai and Bailiffs tried to apprehend the fishermen. Some boats were captured and the names of the occupants taken. The fishermen, acting under orders, did not resist and gave their names when asked. In the meantime most of the other boats had evaded the launches and proceeded upstream to the Power Station where they began to fish, Eventually the launches caught up with them and before night was over 42 names had been taken. At approx. 3 a.m. the boats, what was left of them, returned to base at the Sandmall and one to the Canal. The nights catch was 14 salmon but 9 nets had been seized. Three boats had succeeded in eluding the launches. Despite the lateness of the hour a large crowd of people had collected on the bridge over the Tail Race where they gave the fishermen vocal support. Some stones were thrown from the bridge, and Bailiff, T. O'Connor, received minor injuries. The city was agog with excitment the next day, as stories of the nights events filtered through. Reporters from the National and Cross Channel papers hurried to Limerick. An emergency meeting of fishermen in the afternoon worked out a plan of campaign for thet night. The start was rearranged to take place at 8 p.m. in order to give the public an aoportunity to witness the protest. At 8 p.m. the fleet now augmented by some other boats moved off from the Sandmall in pairs. Onlookers described it as resembling a naval convoy. Thousands of people lined the banks of the Tail Race in addition to the armed military brought in as reinforcements. As the boats approached it became apparent that the proceedings of this night would not go off quietly. Every move of the Bailiffs was met with a round of booing. As the boats entered the Tail Race the Bailiffs pounced, using grappling irons from their launches. Several boats were forced ashore where they were seized and the names of their crews taken. In the excitement the other boats made their escape and as on the previous night proceeded upstream and commenced to fish. Later some of the catch was tossed ashore to the public. When the Bailiffs who had apprehended the first boats made off after the others, the captured boats were retaken by the fishermen much to the satisfaction of the crowd, who cheered lustily. Several free fights took place between Bailiffs ashore and members of the general public. In one such incident Willie Gilligan (R.I.P.) of Peter Cell, was forced at bayonet point to leave the scene while in another incident J. McNamara (no relation to fishermen) of Convent Street and a Bailiff exchanged blows. At this stage the Gardai intervened and began to beat McNamara, who was rescued by Peader O'Donnell (Sinn Fein T.D.) for Donegal during Civil War) who was present as a reporter for An Phoblacht. O'Donnell appealed to the Bailiffs and to one in particular who had a great reputation with the volunteers, to desist in their persecution of the fishermen, asking them to go on strike as a protest against the dirty work they were being asked to perform. Peadar was on the point of swaying the Bailiffs but the fishermen appeared at a crucial moment and before the Bailiffs could make a decision the excitement re-commenced. Writing afterwards in An Phoblacht Peadar commented "The splendid fight of the Abbey Fisheren has been stemmed by methods which disgrace whose who employ them." Sugans Clancy, a rather hot tempered fisherman refused to give up possession of his boat and wrapping himself in his net lay down in the boat resisting the effort of the Bailiffs and Gardai. Eventually when he was freed from the net he plunged into the water and swam off, again to the loudly expressed satisfaction of the spectators. Several shots had to be fired to disperse the crowds who had rushed the cordon when P McNamara (Todsie) swam ashore after being tossed from his brocaun. Excitement was running high and the temper of the spectators was at breaking point. The coming of darkness saved the situation. Inspectator Lane was injured in the hand with a blow from a paddle. Seventeen boats and ten nets were seized this night and conveyed in lorries to Sarsfield Barracks. The nights catch of salmon was only 6. The engagement was broken off at about 2 a.m. because many boats were without nets. One launch was put out of action, its propeller having been fouled by a net. Forty eight names were taken, but seven boats made good their escape and returned to the Sandmall. The following day the fishermen announced that they would re-enter the Tail Race that night. Battle of the Tail Race. Drawing by Bobby Duhig. Some reserve boats were hastily repaired and at 9.15 p.m. ten boats set out from the Sandmall midst scenes of wild enthusiasm. A huge crowd accompanied them along the Island and the Salmon Weir banks. Meanwhile, military set up road blocks at both sides of the Tail Race and the public were kept well back from the scene. The boats approached the Tail Race in line abreast and as they came within reach of the launches, grappling irons were put into action. The fishermen deflected the irons with their paddles and seven boats succeeded in passing the cordon. They did not intend to penetrate far into the waterway on this occasion due to the depleted fleet and after travelling about 500 yards the fishermen spread their nets. The launches were soon on them and six more boats were captured. One boat succeeded in escaping into the main river. Sugans Clancy who had been in the escapade of the previous night was observed attempting to swim into the Tail Race. The action was of short duration and only 2 salmon were caught. The next day rumour had it that the fishermen were building rafts, but I can state that no such attempt took place. At a meeting of the fishermen however, it was decided to continue to protest to the bitter end. Only one boat was available, but a half boat was resurrected from somewhere and this was called into action. A representative from each family was now selected to enter the Tail Race. They were, J. Clancy (Diddles), P. Hayes (Randy), P. McNamara (Balla) and P. McNamara (Boar). They again approached the Tail Race at 9.30 p.m. and faced the defenders with determination. However, the half boat was soon swamped and the other boat was taken by the grapnels. J. Clancy the occupant of the half boat swam towards the Salmon Weir bank and was picked up by a friendly boat which came to his rescue. ''That we the Members of the Limerick Corporation, protest most emphatically against the treatment meted out to the Abbey fishermen, by the past and present Minister for Industry and Commerce. These men, the fathers of families are depending on the fisheries for their living. Since the inauguration of the Shannon Scheme their fishing grounds are rendered useless, as the fish cannot get through to the Upper Shannon. Thousands of fish have been killed by the turbines trying to get through, and those that cannot, remain in the Tail Race and millions of spawn are lost. We endorse the action taken by the fishermen in the protest they are making. We call on the Minister responsible to deal promptly and remedy this grave injustice, and so avoid bloodshed and possible loss of life". In the meantime, Deputies D. Bourke and J. Reidy were having consultations with Senator Connolly acting for the Minister for Industry and Commerce and Mr. Ruttledge, Minister for Lands and Fisheries. As a result of this meeting it was decided that the turbines would be turned off for 17 hours at weekends. This would mean that the water which in the ordinary way would pass through the Tail Race would be diverted to the main river and as a result it was believed that this would entice the fish into the main river from the Tail Race, thus enabling the fishermen to catch them. It was also stated that representations would be made to the Minister of Justice for the release of the seized boats. The fishermen declined to comment on these suggestions until such time as they had conferred with Deputies Bourke and Reidy on their return from Dublin. The fishermen had decided to march in a body to the Labour Exchange to demand Unemployment Assistance but this action was also deferred pending the conference with Deputies Bourke and Reidy. This conference took place in St. Mary's Hall on Saturday, July 16th 1932. The Trades and Labour Council was represented at the conference by M/s Carr, O'Brien and Keyes, Mr. Keyes being chairman of the proceedings. Deputy Bourke outlined the steps taken to induce the different Ministries to grant permission for fishing the Tail Race and said that while the Ministers were sympathetic there was legal difficulties which could not be surmounted. Ald. Reidy also addressed the meeting, and stated that the Minister was preparing a Bill to be introduced shortly in the Dail to deal with the Shannon Fisheries. Mr. O'Brien speaking on behalf of the Labour Party denounced the acts of militarism which had taken place and added that Labour would not stand for a repetition and would meet force with force. Mr. Carr for the Trades Council said the Fishery Conservators were very lax in not forcing the Department to protect the fisheries. The fishermen considered that the shutting off of the turbines at weekends would not satisfy them, as they were not allowed to fish at weekends. They also stated that while they would be glad to have their boats back, they would not accept them if there was any conditions laid down. The order for the handing back of the boats came through the following Monday, with no conditions attached. The boats were collected that evening, some of them in a damaged condition. Emergency repairs were carried out and all crews were on the water again on Tuesday night. The fishermen continued to fish until the end of the season. No further attempt was made to fish the Tail Race openly, pending the introduction of the Fishery Bill in the Dail. It was known however, that the fishermen gleaned a bountiful harvest from the Tail Race that Autumn. Whether or not the authorities knew of this, must ramian a matter for conjecture. An inter Departmental Committee consisting of representatives of the Department of Industry and Commerce, and the Department of Fisheries was set up to investigate means to prevent the distruction of fish. On January 4th 1933, the fishermen were summoned to appear at the City Courthouse before District Justice Flood, to answer charges of illegal fishing in the Tail Race. Mr. McNiece acting for the fishermen pleaded guilty, but emphasised that his clients were carrying out a protest and the charges should not be considered as poaching offenses. Mr. Cullinane for the Limerick Fishery Board concurred and the Justice remarked "I am glad to hear that. Since I came to Limerick, I have always found the Abbey fishermen to be a very peace abiding body of people, and I only hope that this dispute will be satisfactorily fixed up in some way during the near future." Inspector Daly gave evidence of the entry to and fishing of the Tail Race and the seizure of nets and boats on the four nights. Although 48 names had been taken in the Tail Race only 40 summonses had been issued and one was duplicated. The number of charges in each summons varied from four to sixteen, but the fishermen had requested that as they had entered the Tail Race in a united protest there should be no discrimination between those who had fished one, two, three or four nights. This was agreed to and a standard fine of £3 was imposed on each defendant with £1 costs. They were given four months to pay. They continued to fish this year but salmon were becoming very scarce in their main fishing grounds. Guard, "I'm looking for Michael Clancy"
Response, "There's three Michael Clancy's fishermen"
Guard, "Well I have a warrant for all three of them"
Response, "They don't live here, this is Hayes's"
Guard, "Well I have a warrant for Patrick Hayes also"
Response, "Which Patrick would that be,? there's more than one Patrick Hayes, he's not here anyway." The Guard proceeds to the next house on his list. Guard, "Good day Mam, would this be McNamara's"? Guard, "Does Patrick McNamara live here"? Response, "I wonder are you looking for Todsie or Balla"? What time would you like the Band out? Excavation of Foundation Pit for Power House. Foundation Pit for Power Station and Intake Sluice House. Crushing and Washing Plant with Inclined Lift. Interior of the Irish Workmen's Hut. Shovel Excavator Working on Rock in the Tail Race. Head Race. Electrical bucket and bank builder excavator, excavating the canal.